Everything is connected and everything happens, Mr. Gurdjieff says. These ideas and others are convincingly portrayed in Russian-born Vadim Perelman's debut film, House of Sand and Fog, which, though set in contemporary times, bears strong echoes of a classical Greek tragedy. Kathy Niccolo (Jennifer Connelly), a recovering alcoholic, recently separated from her husband, has inherited her father's rundown, seaside California bungalow (a house he'd worked 30 years to own). Deeply depressed, Kathy lets her mail pile up and so learns too late that because of bureaucratic error her house has been auctioned off. 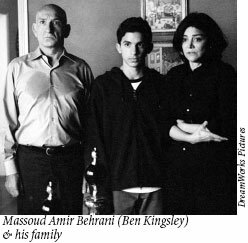 The buyer is Massoud Amir Behrani (Ben Kingsley), a former Iranian air force colonel who fled with his family to the U.S. when the Ayatollah Khomeini came to power. A proud and cultured man, Behrani has struggled to keep up appearances so as to insure a good marriage for his daughter and his standing in the émigré Iranian world. While living in an ornately furnished apartment with sumptuous rugs, he has covertly worked as a day laborer and convenience store clerk. He has bought the house to move into, fix up and then sell at a handsome profit to be used for his son's future college tuition. House in hand, he proudly announces to his family"Today God has kissed our eyes." The house means everything to Behrani. It is the symbol of the American dream come true. It is also Kathy's dream. A black sheep to her family and a wayward loser, her father's house is all she has. Her identification with it is complete. The house is her and she is not going to give it up. She continually drives by, even sleeping outside the fog-swept house in her car.